Gruezi! and Welcome to our Web Page! Swiss Traditions Inc. was started in 1993, when a friend and I realized that every time we’d go to Switzerland, we ended up bringing dog collars back for people who had seen them on our own dogs. Swiss Traditions Inc. still is a small company, but a specialized mail order business. We do a few shows each year, where we look forward to meet with some of our customers and have interesting conversations. Over the years our product range has expanded from dog collars and leashes, to include stuffed puppies (Berners and St.Bernards), cow bells, belts and many more items for doggie owners and people with a connection to, or interest in Switzerland! 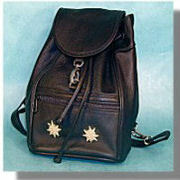 Our leather products are from the Appenzell Region in the north east of Switzerland. There, the tradition of putting cows and herdsmen ornaments on leather clothing, cow bells and dog collars is a several hundred year old tradition that is still going strong. The “Thildy” line of leather items we carry is one of the best in quality and craftsmanship in all of Switzerland. Please browse through all our pages and hopefully you find what you are looking for. If not, let us know so we can see if we can get it for you, or at least help you find it. If you have any comments about our web page, the products we carry, or the products you would like us to carry, we would like to hear from you. So please feel free to drop a line on the contact form.